Page File There are two interesting sides to Steve Hilton, the former political advisor once called “Cameron’s Brain”. One is a kind of Holy Fool, who in Government asked questions nobody else dare ask. How come today we need half a million civil servants, when the British Empire was run with just 4,000 from Somerset House? Why do we need to cosy up to Saudi Arabia? The answers are so obvious they are questions a child would ask, but it’s useful just to have somebody in policy-making to ask them. The other side is TED Talk Man. TED Talk Man is the quintessential advertising guy (and Hilton is an advertising guy) who hoovers up ideas like a whale hoovers up plankton: tiny, bite-sized “counter-intuitive” ideas – petite penseés, if you will – but without thinking too hard about what they mean, if at all. Unlike the Holy Fool, TED Talk Man is the last person you want in Government. When it comes to delivering something that works, the flaws are evident to everyone except TED Talk man – he’s moved on to the next shiny thing. But there is a vacuum in politics and it gets filled with TED Talk Man. Hilton was in Government for only two years, but his fingerprints are on a number of initiatives where the steak conspicuously failed to match the sizzle: Big Society, No.10’s Nudge Unit, GDS (the Government Digital Service). Now he’s back defending them, and arguing for more. There are many paradoxes in this book, not least of which is the title. Hilton sincerely believes in individual empowerment, but wants to achieve it via behaviourism. He’s smitten with “new insights drawn from psychology”. But even if you accept that there have been any new ideas in psychology (which many, and not just psychologists, would strongly dispute), behaviourism is fundamentally a counter-Enlightenment movement. It takes the rich Enlightenment idea of the human individual and replaces it with a nervous and confused rat. He is also inspired by the biologist EO Wilson, a hero of Hilton’s protégé, Rohan Silva. 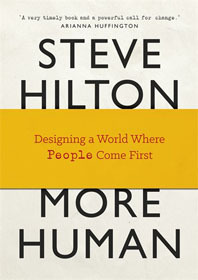 Wilson once called for “a democratically contrived eugenics” and Hilton comes away from a meeting with Wilson thinking “we’ve already made the world too human”. Ah. As the joke goes, “I wouldn't start from here at all”. In practice, the good intentions have had perverse effects. “Libertarian paternalism” has given bureaucrats more things to do. It also means a lot more work for the consultant class. People like… oh, you’ve guessed. It’s a pity because Holy Fool Hilton asks serious questions. Then TED Talk Hilton rushes in with an answer. You’re never far from either a good observation, or a fatuous one. Tax credits are a subsidy for business that keep wages low – no Tory should support them, he argues. That’s fair enough. But then he writes, without irony: “Great entrepreneurs don’t rely on loopholes to make profits.” (YouTube today is based on a loophole, which Google ruthlessly exploits.) And did you know Post-It notes are “the global medium of design thinking”?